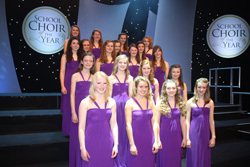 Birmingham and the BBC help showcase Herefordshire Talent … support our girls! Cantabile has been named as one of ‘the very best of school choirs in the UK’ helping Birmingham reverberate with the sound of BBC’s Songs of Praise School Choir of the Year as they attempt to win the coveted title. The Rochester Grammar School from Kent, Lincoln Minster School, The Grey Coat Hospital School from London, “Cantabile” from Hereford Cathedral School, Godolphin from Salisbury and Highgate School from London. It promises to be a memorable line up and ‘a real family treat for audiences’ according to Tommy Nagra, Head of Business Development, BBC Birmingham. This entry was posted in Cantabile Girls Choir, Events, Press coverage, Songs of Praise Choir of the Year and tagged BBC Birmingham, Cantabile Girls Choir, Hereford Cathedral Schools Cantabile Girls Choir Songs of Praise on February 11, 2014 by cantabilegirlschoir.